Community Mobilizer Adyasi Bamusi (left) receives advice on bicycle care from Lilongwe District Environmental Health Officer Mavuto Thomas. A group of eight Voluntary Medical Male Circumcision (VMMC) Community Mobilizers can breathe a sigh of relief after receiving bicycles to ease mobility in their clusters. The beneficiaries were selected based on the remote areas and long distances they cover. 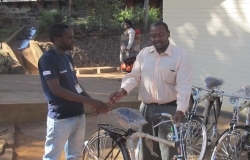 Desiree Mhango, I-TECH Malawi’s Deputy Country Director, presented the bicycles. During the ceremony, Lilongwe District Environmental Health Officer Mavuto Thomas, thanked I-TECH for the donation of the 10 bicycles, saying they will be a huge help to mobilizers as they disseminate information on the importance of male circumcision. Mr. Thomas further advised the eight beneficiaries to take good care of the bicycles in order to sustain their usefulness well into the future. One of the beneficiaries, Adyasi Bamusi, said the bicycles will not only solve mobility problems in rural communities, but also will be used to ferry clients to circumcision centers. I-TECH’s VMMC program, administered in partnership with the Lilongwe District Health Office, is funded by the Health Resources and Services Administration (HRSA) in collaboration with the U.S. Centers for Disease Control and Prevention’s Division of Global HIV and AIDS (CDC-DGHA), under the U.S. President’s Emergency Plan for AIDS Relief (PEPFAR). The donation is part of a pilot study examining the impact of bicycles on the effectiveness of community mobilizers in rural areas.